This water basin automatically refills to a desired level, eliminating the need for manual refill. An automatic non-siphon valve adjusts the water level by the turn of a knob. Water stays clean and fresh. Each water basin is made from rotational molded, high quality, FDA approved UV protected plastic to ensure uniform thickness and strength for maximum durability and longevity. The one piece construction eliminates cracking and splitting. The sloped sides prevent large animals from grabbing the tank and flipping it. The wider base prevents any chance of tipping. Do you have a horse or pony that likes to stomp and splash in water? No problem...the supply valve is tucked away safely from any harm. The tank will refill. When you feel a need to clean it, simply shut the valve for the water supply, slosh the water in the basin out...wipe clean. It's almost as easy as cleaning the kitchen sink. All edges have been rounded for safety and strength. If the tank gets a small leak due to unforeseen circumstances, such as a bullet hole, it can be braze welded with a common butane torch to fill the hole. 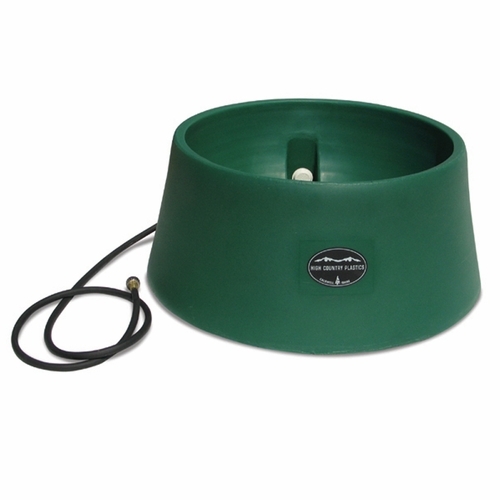 This is an IDEAL water container for large and small livestock, miniature horses, kennels. Actual weight: 13 lbs. Dimensions: Base is 31" diameter. Top is 26" diameter. Height is 14".